GREY CUP 2002 in Edmonton 155 students and 22 chaperones...a weekend trip to Canada's Super Bowl. Rendezvous Regina performance - Shaw Center - 4 p.m. Sat. Churchill Park....Santa tree lighting ceremony - 5:30 p.m. Sat. CFL Cheerleaders Tournament - Grant McEwan Center 6:40 p.m. Sat. 5:00 Leave for Yorkton following Half Time ? Activities may be subject to change. Accommodations - schools as listed above. Fee includes transportation, accommodation and some meals. 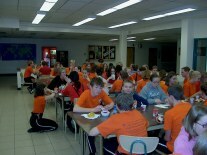 Breakfasts, lunches and suppers are included in the tour fee. Spending money will be needed for treats and souvenirs. Mall day (Saturday) ….students/chaperones will buy their own lunch at noon. Allow $10.00. McDonald hamburger coupon will be provided. 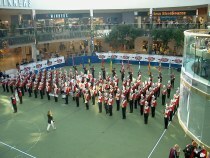 Band uniform consisting of band jackets, pants, black shoes and socks. ( band hat and overlay for indoor performances - toques and flip mitts will be provided for out door performances) Provincial Flag and Banner carriers (Color Party) uniform - Band wind suits to be worn with black shoes and shocks. Do not leave without BLACK socks and shoes. Bring extra socks. Please check to see your uniform fits and is neatly pressed. Label the uniform and garment bag with your name and school. Temperature will be cold…so wear long underwear..lots of light layers, warm socks, etc . Chaperones - Band jacket and Red Band Shirt. SLEEPING BAG, PILLOW AND AIR MATTRESS are necessary for our school gym floors. Space is limited for foam mattresses. Keep your wardrobe to essentials: pyjamas, changes of clothes for free time. Swim suit and towel. Use good judgement, please use a small suitcase as space will be very limited. Label every article with your name and school. If you are bringing portable CD players, you must have headphones. No speakers will be allowed. Small instruments (flutes/clarinets) will be loaded on the upper level in the overhead compartments on the bus, or under the seat. Make sure your instrument is clean and in good working condition. Please bring valve oil, extra reeds, and any other extra accessories you feel you may need. Special oil will be provided for outdoor performances. Be sure your case is labeled with your name, phone number and school. Rehearsal schedule! Time is very limited to prepare for this tour so students are requested to spend individual time learning their music.! Music is to be memorized. 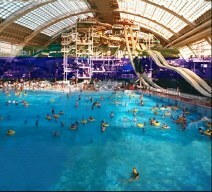 Other activities: students and chaperones will have free time to splash around the West Edmonton Mall World Waterpark as well as shop in one of North America's finest malls. * World Waterpark - 10:00 am - 8 p.m. Zero tolerance to drinking alcohol or using drugs. Violation of the above guidelines could result in the student being sent home at the parent's expense.